Time begins in the Psychic Cosmos in the form of Transcendent Time, or chronos. Here, time is created by the Celestial Demiurge as an image of Aion. While Aion rests in unity, Time moves in accordance to number, and is created as part of the Demiurge’s ordering of the cosmos. There isn’t a “before” and “after” in the Psychic Cosmos– rather time is immediate, with cause and effect being concurrent. Because Transcendent Time is instantaneous in the Psychic Cosmos, it isn’t a measurement of alteration, which might be confusing or seem contradictory to what modern concepts of time is. This is because in the Psychic Cosmos time isn’t ordered, but rather ordering: “there is an order of time, not however an order which is ordered, but one which orders…” (Iamblichus 1973, Frag. 63). The ability for Transcendent Time to function in this manner comes from Nous, the Divine Mind/Celestial Demiurge, who organizes the cosmos, of which Transcendent Time takes part in organization. As stated, Transcendent Time is described as an image of Aion in the Psychic Cosmos. 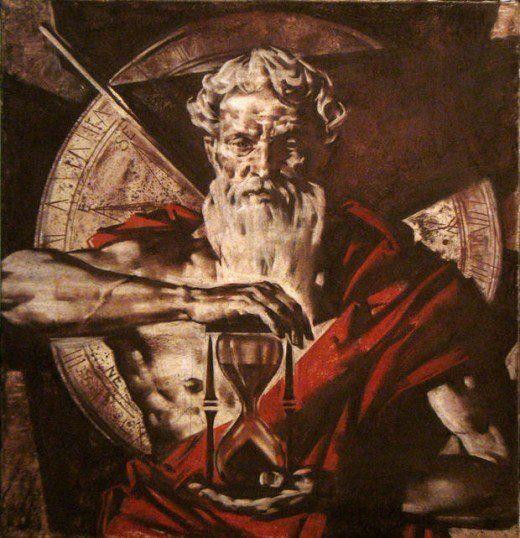 Time is an image of Aion by the method of Time’s “cyclic unfolding and continuity and successiveness, and by distinguishing beginnings and middles and ends and in not to any extent being found wanting to any of the things encompassed by it…” (Iamblichus 1973, Frag. 64). Ultimately, Time is an image of Aion because Time participates Aion, and things that participate an ontologically prior reality preserve within themselves something of what they participate, holding an image or imprint of the higher essence. Time is also the first image, because Aion can’t be said to be an image of the One, because the One has no image. Because of this, the nature of Time and its relationship to the Psychic Cosmos, we might conclude that the Psychic Cosmos is itself an image of the Intelligible Realm, just as Psyche (Soul) participates Nous. Likewise, the cosmos are an image of the Whole Soul (Nous in the Psychic Cosmos). The human soul, therefore, exists as an image within an image of an image of Aion. The first quality comes from Being, and is the idea of “was” and “will be”. This first quality is the granting of Being. The second quality comes from Life, and is the idea of “becoming younger and older”. This second quality indicates the idea of growth from Life. The third quality comes from Intellect, and is the idea of “coming to be at the same time, having now come to be or destined to be on another occasion.” This third quality, rather surprisingly, isn’t the granting of intellect, but is rather the granting of the idea of individuation, which is related to Nous (The Divine Mind/Celestial Demiurge), since it is the Celestial Demiurge who establishes duality, and thus individualization, when He ordered the cosmos through the logoi. Time does not contain these within itself, but rather passes these along to the sensible realm and mundane time, essentially acting as a bridge between the Intelligible Cosmos above it and Phenomenal Cosmos below it. Even when Time isn’t seen in a direct relation to motion, we still find a connection between the ideas of Time and space. Once again, this isn’t physical space, but rather an ordering Transcendent Space. Space comes into being simultaneously with bodies, inseparably linking them together– but these bodies being discussed are divine and ethereal, not mortal and physical. To think of Space as merely material or physical is a “perverting [of] its essence into bounds of surfaces” and fails to connect “nature to the activity of the Demiurge” (Iamblichus 1973, Frag. 90). Space is directly linked to the causative forces of creation, and cannot be removed from that cause to be understood in merely physical terms. Instead of seeing space and bodies as separate, Iamblichus says that in the Psychic Cosmos space and bodies are connatural. Rather than simply where bodies exist, Space is completion of bodies, and a unifying force. It is a corporeal power that “supports bodies and forces them apart and gathers them up when they fall and collects them together when they are scattered about, at once completing them and encompassing them about from all sides” (Iamblichus 1973, Frag. 90). Iamblichus. Fragments of Iamblichus’ Commentary on the Timaeus. Translated by John M. Dillon. Leiden, South Holland: Brill Books, 1973.